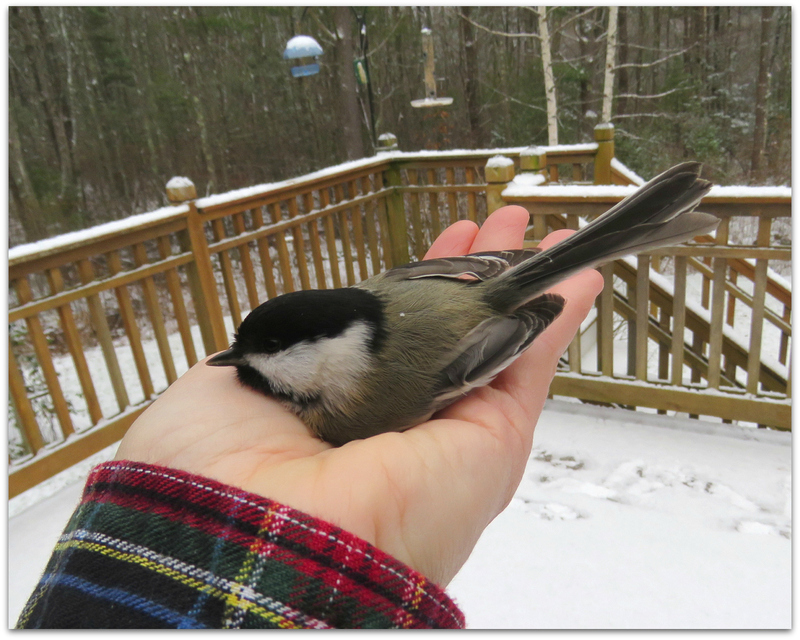 A chickadee flew into the sliding glass door yesterday (even though I have reflective snowflake decals on it). It lay on its back in the snow, feet in the air, motionless, beak agape. I was standing in front of the door when it happened, camera in hand. I went outside and picked it up. I had my camera because I was taking pictures of bluebirds. See Flickr album: 8 Bluebirds One Saturday. What are the odds? The chickadee was all in one piece, feathers intact and smooth. It revived pretty quickly. But it stayed in my hand. For a long time! Holding a warm soft perfect little wild bird feels good. The feeling runs from your hand up your arm into some center place of your being. But I can’t stand out here forever, holding a bird. 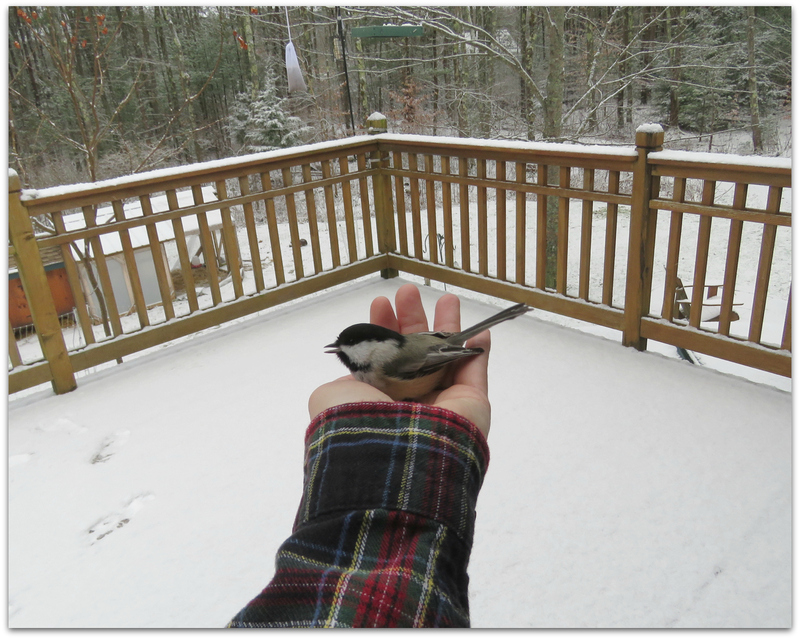 I walked over to the porch rail and rested my hand there until the chickadee hopped off. It just sat there for a while looking at me, cocking its head from one side to the other while I talked to it (“see, you’re okay, all better, be careful of the glass” etc) like the crazy bird lady I am apparently becoming. “But you’re our crazy bird lady,” said a friend on Facebook when I posted the photos and spread the bird wonder a little further out into the world. “How is this happening? ?” commented another friend who probably saw a photo of a downy woodpecker in my hand recently too. Well, it all started… back in May near the beginning of this blog… with a wish. I wished to be closer to birds. I wished they would hold still enough for me to take good pictures of them to share. Bang! Grackle grants wish instantly. The feeders are located where they need to be for viewing and attaching. And I have decals on all the windows now. Sorry for the headaches, birds, but I’m glad you’ve only been stunned not killed. 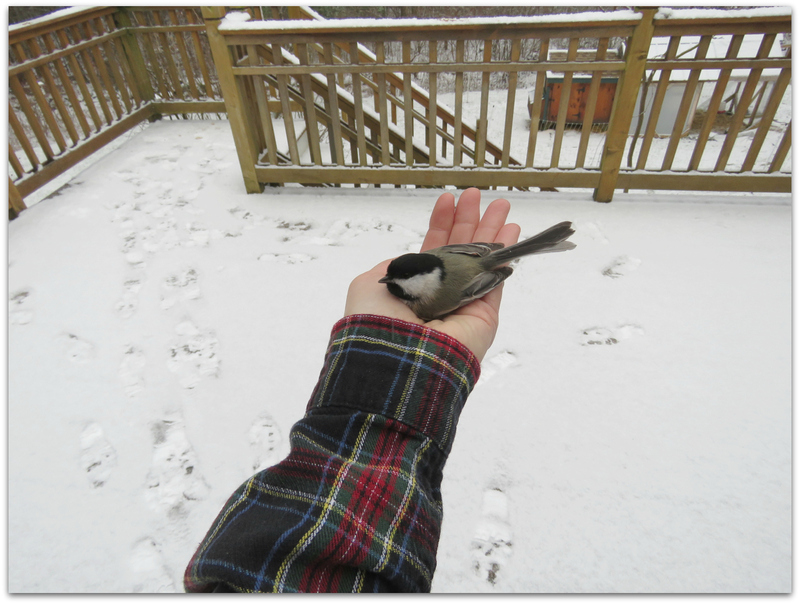 It was just on December 7 that I wrote, of chickadees: I won’t be surprised if one lands on my shoulder or head someday while I’m near the feeders. 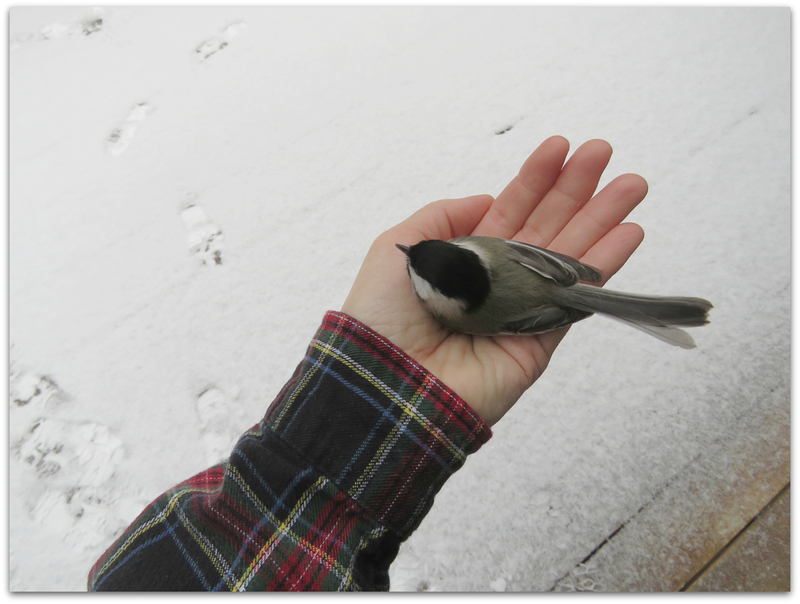 Even better: chickadee in my hand. Hm, let’s try this: I wish for a million dollars! I won’t be surprised if I buy a lottery ticket and win a million dollars! And I’ll give half of it to a bird charity! I started Project Feederwatch today. This entry was posted in Uncategorized and tagged birds, birds hitting windows, Black-capped Chickadee, chickadee, crazy bird lady, Flickr on December 14, 2014 by Amy.